Fincar containing the active ingredient finasteride is considered a 5-alpha reductase inhibitor type of medication. It works by preventing the conversion of testosterone to dihydrotestosterone (DHT) in the body. The 5mg tablet is used to treat patients with benign prostatic hyperplasia (BPH) in men with an enlarged prostate. It will help shrink the prostate and reduce the risk of urinary retention caused by restricted urine flow as the prostate becomes enlarged. In lower doses, the medication may also be used to treat male pattern baldness. 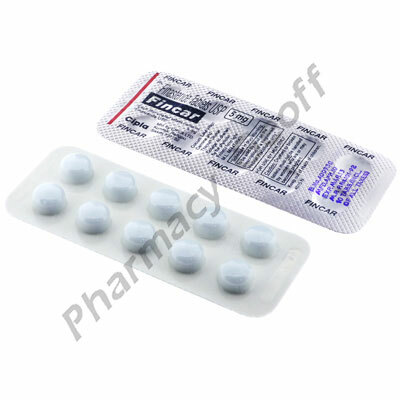 Fincar is usually taken orally once per day or as directed by a doctor. The tablets can be taken with or without food but should be taken with a glass of water. Contact a doctor for the correct dosage and length of treatment as it will depend on the patient's condition and their response to the medication. The tablets should be swallowed whole and not chewed or bitten as it may make the mouth or throat sore. Fincar is not always suitable for all patients. Always consult your health care provider prior to using this medication if you are pregnant, breastfeeding, trying to conceive, using any other medication (prescription or non-prescription), using any herbal products or supplements, or if you have any allergies or other health problems.